New President, Hollow Body/Semi Hollow Body Electric Guitar from Hofner Guitars in the Gold Label series. To complete the Gold Label Series, Höfner added a collection of New President guitars, which includes a model equipped with a vibrato. The 9 New President guitars have a spruce top with two F holes, flamed maple archtop back, sides and neck. The ebony fingerboard has 22 frets. The nut width is 44mm and the scale length 633mm. Höfner has equipped these guitars with two Diamond pickup, two volume and two tone controls and a 3-way pickup selector. The New President is available in Bright Red, Ivory, Royal Blue, Gloss Purple, Light Blue, Gloss Black, Blue Pearl, Grey and Sunburst finishes. The last one is the only model equipped with a vibrato. 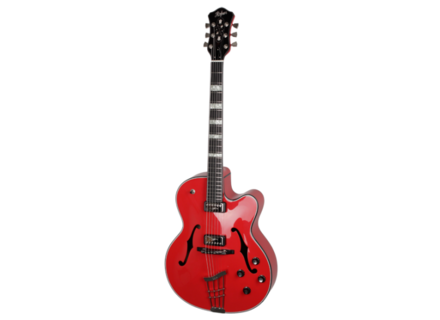 Discover these guitars on www.hofner-guitars.com. [NAMM] Engl Ironball amp head Engl will introduce at NAMM 2013 a new all-tube 20W guitar amplifier head named Ironball. [NAMM] Fender Ritchie Blackmore Tribute Strat The Fender Custom Shop pays tribute to the Deep Purple guitar player with the Ritchie Blackmore Tribute Statocaster guitar. [NAMM] Kemper confirms the Profiling Amp Rack Soon after we announced it yesterday, Kemper confirmed the launch of the rack version of their amp simulator, along with an amplified version.